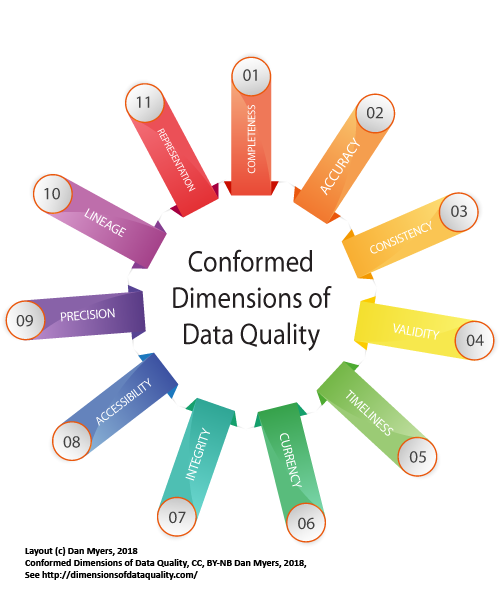 In order to give you some context regarding this proposed standard set of the dimensions of data quality I've outlined the history of the Conformed Dimensions, and ongoing research on the subject below. 2013, After recognizing an opportunity to normalize various author's lists of the dimensions of data quality, I compared six major DQ authors' works in a series of articles on Information-Management.com. These articles walk you through the proof for a set of Conformed Dimensions that include the best of each author's work, but adhere to the least common denominator at the same time. 2015, In order to refine this set of Conformed Dimensions through review by a broader audience, I started the Dimensions of Data Quality survey. Additional language and a few nuances were identified (primarily now included in the non-standard vocabulary). 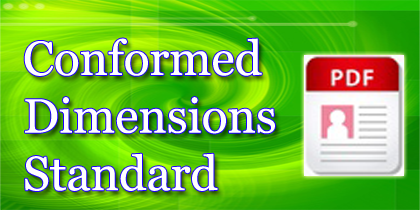 2016, In order to provide the Conformed Dimensions, on-demand, to a broader audience, I registered "DimensionsOfDataQuality.com" and posted the Conformed Dimensions for others to use. Additionally, I repeated the Dimensions of Data Quality survey in order to validate the 2015 findings and further understand how organizations use the dimensions of data quality. 2017, The third year that the Dimensions of Data Quality survey was conducted revealed a number of nascent industries and ongoing changes in popularity of the different dimensions.